A four unit set of Lehigh Valley Alco FA-1's with a Nathan M-3, recorded by me back in 1967. Elwood's Zero bell M-3 A, C#, E.
This is the most accurate recording of an M3H the web master has heard so far. His M3H was tuned by Ken Lanovich, and sounds just like this one. This Holden M3H belongs to Eric Marks. Ex-CN (Newfoundland narrow gauge division), recorded by Jon Archibald, near the Trent River in Peterborough, Ontario, 2001. Thanks Jon! Nathan M-4. Experiment built by me. Sounds a lovely A, C#, E, A. Give a listen! The M5 was first produced in 1950 as a refinement of the H-5. Gone were the external copper tubes supplying air to each bell, replaced by a more substantial manifold. The placement of the bells and design of the back caps were also different. The chord and the beautiful timbre remained, however. The first M5's made in 1950 looked like the one at left. The horn bells are perfectly round where they meet the manifold (or base). Subsequent refinements in 1951 resulted in so-called "scallop base" horns such as the one at the top of the page. The M5 was the common horn on the Western Pacific, Southern, Atlantic Coast Line, Seaboard Air Line, Richmond Fredricksburg & Potomac, Baltimore & Ohio, Chesapeake & Ohio, and other eastern railroads. Southern Pacific had M5's on many of their passenger service locomotives. The Western Maryland Railroad had pairs of M5's on many of their cab units. No railroads are known to have purchased M5's in recent years, but they can still be purchased new...for a price. The horn pictured at left was bought new from Nathan in 1999. Original tuning was: A major dominant 7th (C#,E,G,A,C#). Many other variations were possible, though, even from the factory. The horn used the M-series #1, 2, 3, 4, and 5 bells. 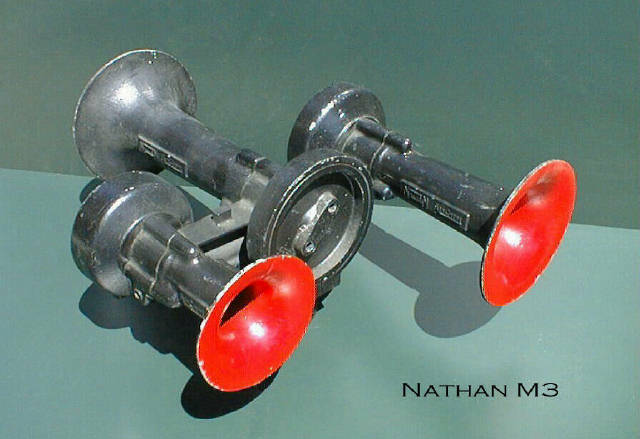 The M-series horns turned out to be relatively high-maintenance items, and with the development of lower-maintenance horns from both Nathan and Leslie, the M's fell out of favor. Few if any railroads have acquired new M5's since the early 1980's. There are virtually no M5's in regular use on major freight railroads, but some can still be heard on excursion and tourist railroads and a handful of shortlines. The M-series horns were tunable, and were supposed to be retuned and voiced every six months or so to keep them sounding properly. Unfortunately, many railroads neglected to maintain the M's properly. Left to fend for themselves, the horns soon went out of tune. Sometimes they managed to sound good, if different, despite deferred maintenance. Other times they did not. M5 with 3/16" orifices. The M Series horns, unlike other train horns, are tuneable by adjusting the end caps. This one still needs some adjustment on one bell according to the author. Ray Weart comments: This clip is of my L&N round base M5R24 with a WC GP40 installed underneath in 1999 it back when we ran our road local on Sundays. A good friend of mine got this on tape thankfully; I only wish he could have gotten more of them as this was not the only time I did this. Burnett M-5 D# minor 7th. C#, D#, F#, A#, C#. Made by me on the Reading & Northern, one of their U-23b's. Nathan M5 in service on April 20, 2004. This M5 is owned by one of the railroad's employees, and is ALWAYS removed from the locomotive and secured after use. A Nathan M5 in active service on the Michigan Southern. The M5 is usually considered as the best sounding locomotive horn. The M3 was first produced in 1950 as a derivative of the M5. As with the early M5's, the first year of M3 production featured bells that were round where they joined the manifold (or base), such as the horn at left. In 1951, the design was modified to the so-called "scallop base" shape illustrated by the horn shown above. M3's were the common horn on the Denver Rio Grande Western and were quite common on locomotives operated by SP, SP&S, Pennsy, D&H and many other eastern railroads. The M3RT1 is a variation of the M3 in which the #1 bell has an elliptical flare and is angled upward 10 degrees from horizontal. It is believed that this modification was made for the Delaware & Hudson so the horn could be mounted on the "shelf" in front of the cab of their Alco RS-3 locomotives and have the rear-facing #1 bell clear the cab roof. The sound is the same as a standard M3. Factory tuning for the M3 was: A major triad (C#,E,A). Over time as a result of use, C#,D#,A, C#,E,A#, and C#,D#,A# dischords were common. The horn used the M-series #1, 2, and 4 bells. The M3 suffered the maintenance problems common to all M-series horns. Once very popular, few new M3's have been made since the early 1980's, and the horns are rare to find in use today. Willamette & Pacific applied old M3's to most of their locomotives in the 1990's, and a few shortlines still have locomotives with M3's. A scattered handful of M3's survive on Union Pacific, mostly on former Rio Grande power. The M3H was introduced in the early 1950's to comply with Canadian regulations that mandated the D# minor chord for locomotive horns. 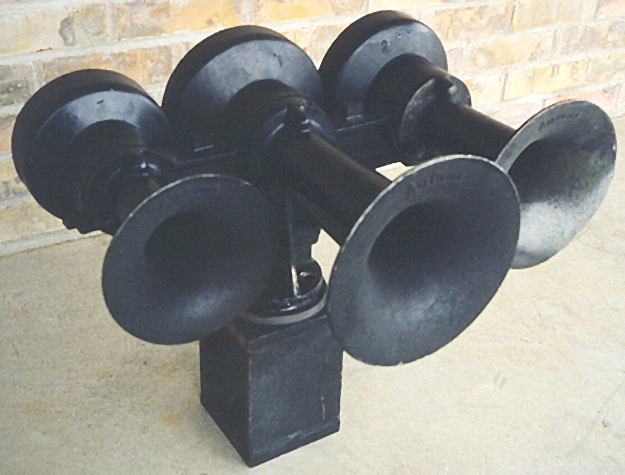 The horn used bells #2, 3, and 4 from the M5 fitted with the #1, 2, and 4 power chambers respectively. The picture illustrates an all bells forward M3H produced by AirChime licensee Holden Ltd. Factory tuning for the M3H was: D# minor triad (D#, F#, A#). The M3H has been largely supplanted by the low-maintenance K3H, and no new M3H's have been ordered for locomotives since the late 70's or early 80's. A dwindling number of M3H's can still be found on former Grand Trunk Western locomotives.